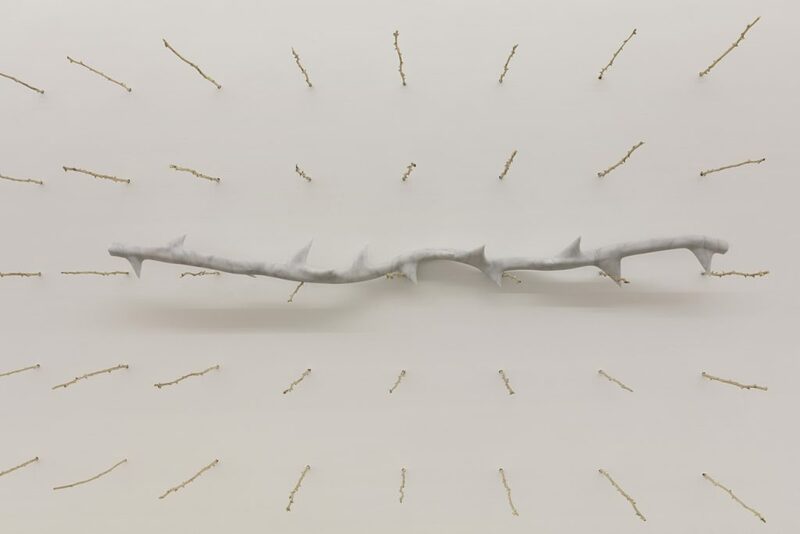 “O espírito da coisa” (The spirit of things) was the title that Brazilian critic Rodrigo Naves chose, in 1998, for his essay on the artist Nelson Felix in which he discussed how the artist’s production is marked mainly by transubstantiation of elements and by a “trend to suggest an interiority in the things we see, beyond its simple appearance.” I could add that this interiority, proposed by Felix, also reveals a certain interdependence of things visible in the connections, formal and semantic, between his artworks in the space they occupy. So that if we tried to separate them, their senses would be completely lost. 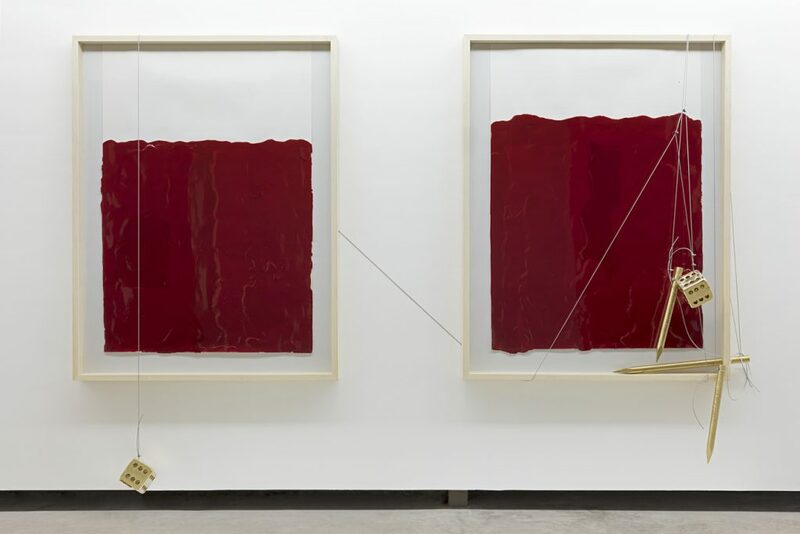 Born in Rio de Janeiro in 1954, Nelson Felix has been a prominent figure in the contemporary scene since 1978, when he participated of the “Artistas Cariocas” exhibition at the Fundação Bienal de São Paulo. Drawing and sculpture are central elements in his work. In 1984, the artist began several groups of works derived from geographic coordinates comprising the “Método poético para descontrole de localidade” (Poetic method to decontrol the locality). 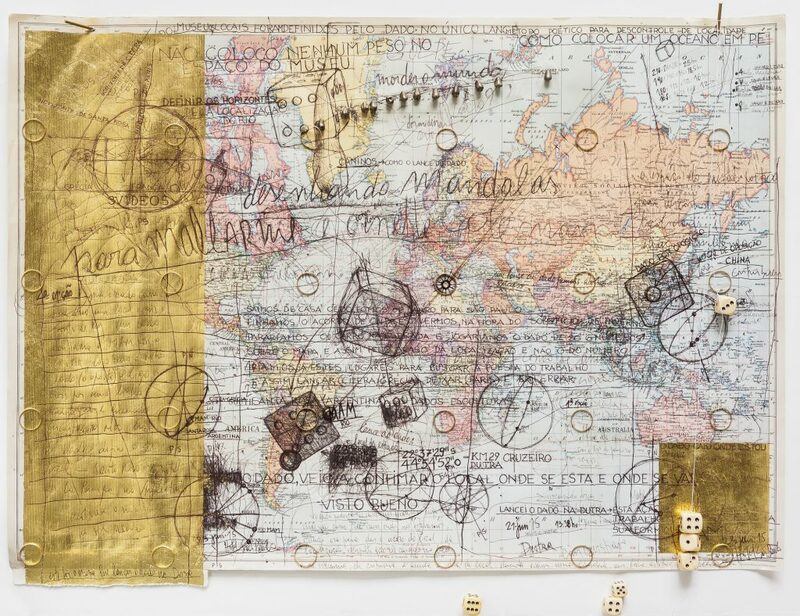 ​Mapa da Dutra, 2017, ink, map, dice, line, gold and bronze/Photo: Gabi Carrera. 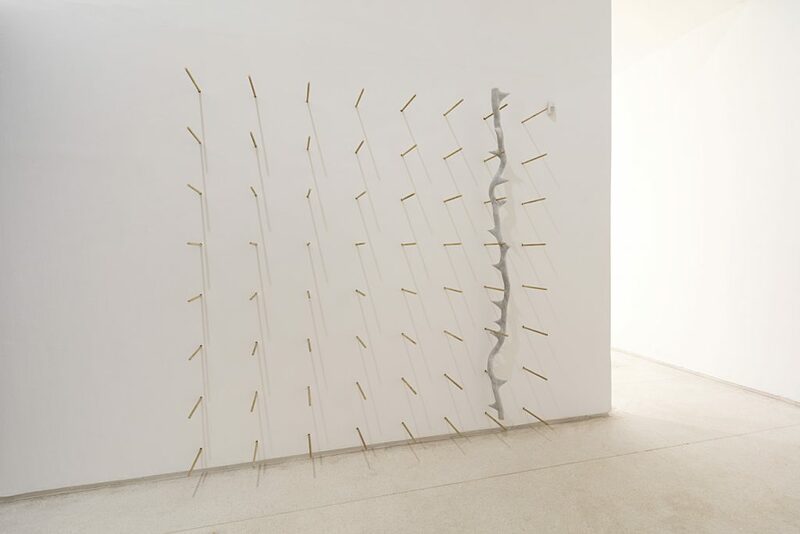 The fourth and final part of that series unfolds in two simultaneous exhibitions: “Variações para Cítera e Santa Rosa” (Variations for Cítera and Santa Rosa) occupying the gallery and annex of Millan in São Paulo, and “Trilha para 2 lugares e trilha para 2 lugares” (Track for 2 places and track for 2 places), which takes place at the Museum of Modern Art of Rio de Janeiro (MAM). Like all the parts of the “Método” series, this last one started from a text with the intention to generate a reality to be inhabited by sculptures, drawings, photographs and other media. The chosen text was the iconic poem, “Un coup de dés jamais n’abolira le hasard, by Stéphane Mallarmé. Using the concept of chance presented in the poem, the artist threw two dice on the world map, and the final position of these would define the cities where the work would be performed. The result was the Greek island of Cítera, and the city of Santa Rosa, in the Argentinean Pampa. I was able to visit only the exhibition in São Paulo. The gallery space gathered works related to Cítera that occupied its entrance and hallway and included both sculptures that aggressively penetrated the architecture of space, and a series of drawings over maps dedicated to Mallarmé. About a hundred meters away, in the annex, I found works in reference to the city of Santa Rosa: more formal, some of which contained a rose flower and hidden drawings, as well as the strong presence of the color red establishing the relationship between the organic and the cultural object, also one of the main axes of Felix’s practice. The aesthetic passage from one space to the other occurs in a discontinuous way, in terms of content, but remains very cohesive aesthetically. I spoke with the artist on the phone about this last breath of the “Método Poético” as well as his experiences during the thirty-three years that this “opera in four acts” took to be completed. For this last work, you decided to start from the poem, “Un coup de dés jamais n’abolira le hasard,” by Stéphane Mallarmé. Can you tell us a bit about this choice? The four works of the “Método Poético” are, in a general sense, a thought about space, a way of philosophizing without words. It is about thinking about something through images, objects and actions. 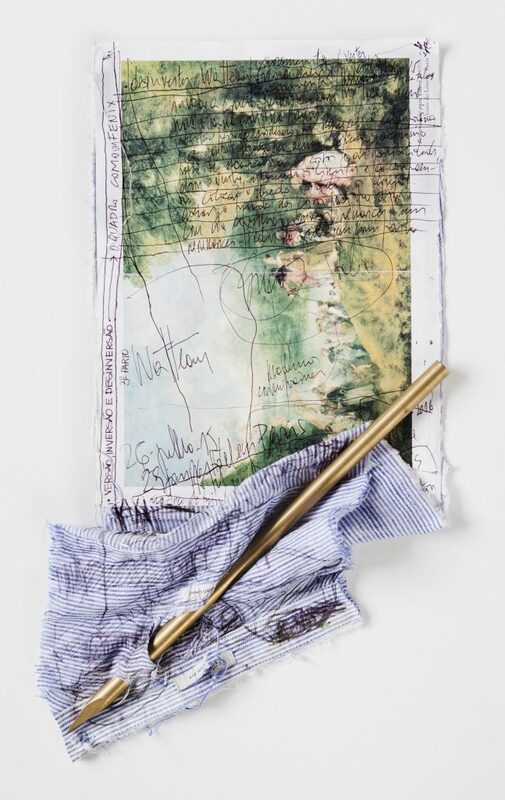 I began to study this poem in 1987 and concluded that perhaps this was the fuse of contemporary art, although it also inaugurated the modern space because prior to Mallarmé, there was Verlaine and Baudelaire, who inaugurated the modern process. But I believe that the contemporary has consolidated with this poem and we realized this only later. Duchamp, who was a librarian, saw this poem and drew from it the idea of ​​chance for his own work. So this poem influenced Duchamp and from it derived everything we have produced so far. When I realized that this was a seminal poem, I chose to leave it in the corner of my head because I considered it very obvious at the time. Only years later I returned to it as a way of thinking poetically of the space. It is a series that, as the title itself suggests, always involves a geographical displacement. Do you consider this displacement a kind of experience of psychogeographical drift, as defined by the Frenchman Guy Debord? Are you familiar with his ideas? No, I only know him by name but I have never read any of his essays. The idea of ​​using geographical places began with the large number of invitations I received, between the late 1980s and the early 1990s, to develop site-specific works and this started to bother me deeply because it had become a kind of motto, at the time, to make art. From that annoyance I decided to think about the space itself. And I began to develop works that gave me a sense of outer and inner space where I did not know very well what I was in. At the beginning, I used geographic coordinates that gave rise to some works like “Cruz na América” ​​(1984-2004) and “Concerto para Encanto e Anel” (2005-2009). In the “Método Poético” specifically, I smear the places from the geographic displacement to later gather, into space, all the sensations that I had during its construction, seeking a total lack of control. These are works that started from long hours drawing my surroundings until I totally impregnated myself of it. It is not a “drawing of observation”; it is more a numbing process and how to implant a poetic singing in space from the drawing sensations. Can you tell me how you divided the groups of artworks between the gallery and the annex? The gallery space has a lot to do with Cítera, the Greek island, and the annex is related to Santa Rosa, which is considered the capital of the Argentine Pampas. This kind of work demands an openness to everything that happens to you because, sometimes, premonitory things just happen. I explain: shortly before I went to Cítera, I began to carve stems of roses. When I arrived on the island I walked through a place full of thorns and there I remembered that the other place that had been chosen by the dice was literally Santa Rosa (Saint Rose). This anticipation of events is, to me, a sort of work confirmation. When I passed through Acropolis in Athens to reach Cítera, I observed the architectural constructions (their proportions and dimensions), and then I realized that the Greek layout contributed to our formation. And thinking about it, I looked at the works in the gallery and noticed that I left it practically empty. The main works takes place outside, down the hall or at the entrance. This ratio between inside and outside came from my architectural experience in Greece. Santa Rosa, in the Argentine Pampas, is more literal: the flower itself and the color red. There is no intellectual speech; it is another type of intelligence that is captured by drawing, which allows me to make these kind of non-logical relationships. For me the Pampa worked as a mirror where I had to live with myself the whole time. I spent a week, once, in the bush of the city of Uruguaiana and it was there that the idea of ​​the Pampa appeared as a mirror of the soul: where things come in, knock and reflect out. Same as the artistic process: you observe things, absorb, it hits your soul, touches you and returns out. Art allows you this kind of experience and the beauty of it is exactly this articulation between the various types of thinking: from the scientific to the poetic. Escultura de Caule II, 2017, marble and bronze​/Photo: Everton Ballardin. The first time you used stakes I think it was in the work “Grande Buddha” (1985). They also appear in the Millan show. Can you tell me a bit about these architectural interventions with them? I guess I hadn’t noticed this relationship until now. But now I realized that in the “Grande Buddha” they acted only as thorns, so they had a different connotation. Their presence was more evident in the work “4 Cantos” (2008-2013), in Portugal, which are also part of the “Método Poético” series. To me they confer aggressiveness. How would you define their presence in your practice? There are two aspects: the first concerns the stake as an instrument, the primordial tip of the sculptor. In the annex, although it has a classic harmony and beauty, it is extremely distressing. All the work I do is somehow distressing and contains, at heart, that aggressiveness. But it is a sublime aggression due to a spiritual vision that I have of the world. This is the second aspect. I dedicated my life doing two things: art and transforming my character. It is a difficult battle in this contemporary world that demands intelligence to maintain an attitude that does not corrupt you. For me spirituality is something aggressive because you tear apart pieces of yourself throwing out everything that no longer serves you. It is literally like a stone such as a marble: you pull out what it is not good to make it acquire a new form. As a sculptor, I dedicated my whole life doing this. The rose itself is surrounded by thorns. This to me is one of the most beautiful and deepest things I could found. Beauty has been a difficult word to use nowadays, but I see beauty in this struggle with things around so that they acquire better qualities. These are issues present both in the “Grande Buddha” and in my work in a whole. 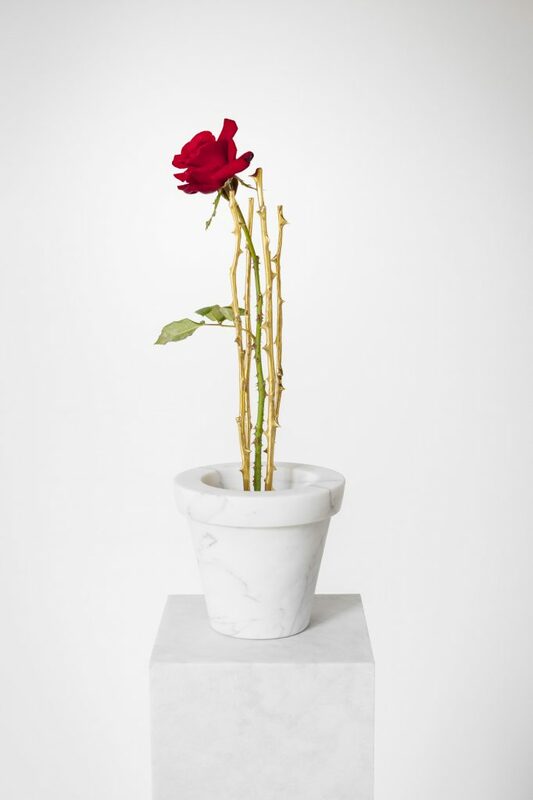 Rosa, 2016, rose, bronze and marble​/Photo: Gabi Carrera. And what else do you see your work in a whole? I think I’ve been doing the same work since I started, as if they were various acts of an opera. When a work nears completion, I leave an open coordinate for the next. Drawing and sculpture are central elements in my work. Drawing is something sacred. Sculpture is an exercise in thinking this language by experiencing it. Like a musician who spends a whole day playing piano so he can think about music, regardless of composition, without the use of verbal discourse. My works are like thoughts that draw one another, infinitely. You once said once that poetry, by touching things, transforms and makes them acquire new relationships. Can you balance the transforming poetical experiences you have had from the beginning of the series in 1984 to the fourth part you present today? What made you feel that it was over? As I mentioned, it’s like a four-part opera. I could have done it in five or six, but I felt that in four acts the desire to approach space poetically had already been completed. The verse for things, a song where there was no song, an abstract space and a totally unstructured one. All these steps go a little through the Theory of Strings, in which everything operates in the microcosm. 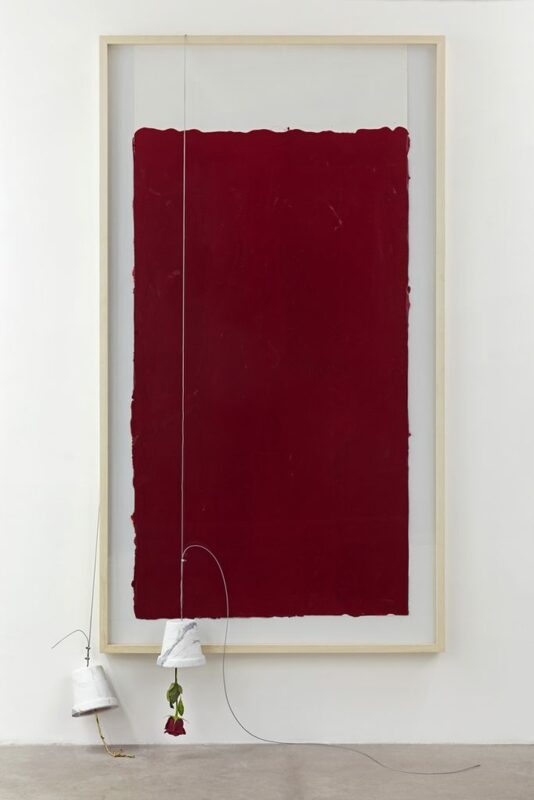 In the exhibition at the Millan Gallery, if you notice, there is a cycle between the forms: a thorn that penetrates the rose, which generates the red color and so on. It is a circular and connecting movement, but always a little different at the same time. I think it may be a bit difficult to talk and write about my work because it is impossible to address one subject without relating to three others.